Freshman Democrat lawmaker Ilhan Omar triggered an earthquake in Washington that split the political aisle when she touched the forbidden third rail, which is any discussion of the pro-Israeli lobby’s influence on the US political system. 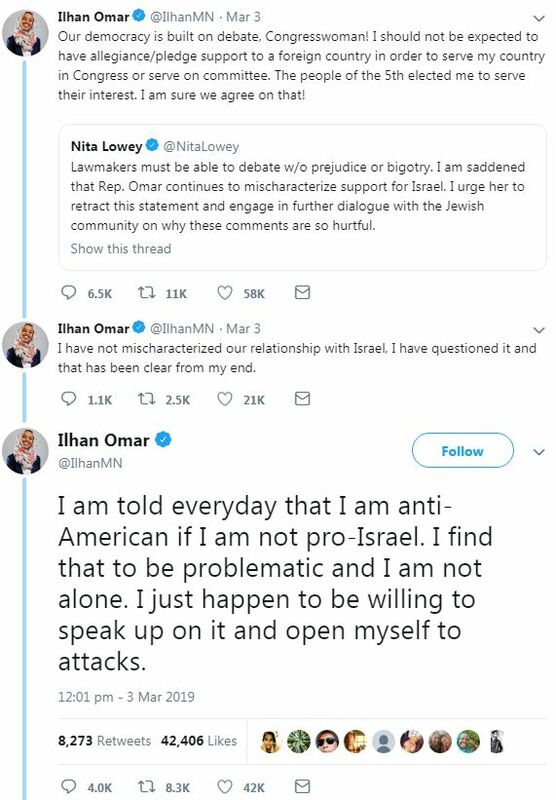 Judging how she prefaced the remark, with a lengthy discussion about “the stories of Palestinians” and how she was being regularly accused of ‘anti-Semitism’ to end all debate on the decades-old standoff, it was clear what lobbying group Omar was referring to. 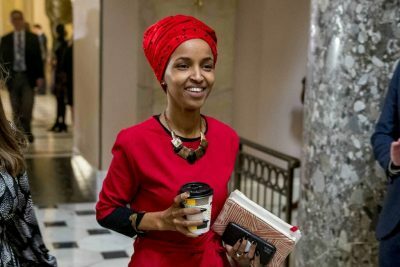 It was the second time in as many weeks that Ilhan Omar, one of the first two Muslims to serve in Congress, was accused of allegedly espousing anti-Semitic comments. Omar responded, “It’s all about the Benjamins baby,” followed by a musical emoji. In fact, Omar was wrong. AIPAC does not raise funds for candidates. But its members do, with the group’s powerful endorsement. Such complaints have been heard before. In 2014, former Congresswoman Cynthia McKinney told Press TV that her campaign funding suddenly went “kaput” after she refused to sign a “pledge of allegiance” to Israel while she was in office. “I refused to toe the line on US policy for Israel,” she said. Omar’s string of remarks quickly sparked similar debate, but this time inside of the Democratic Party. This demonstrated the potential future impact of a new generation of multiethnic lawmakers, many of whom, as Muslims, are increasingly frustrated by the Israeli-Palestinian crisis and their inability to discuss it. Omar, however, was quickly upbraided by senior Democrats. 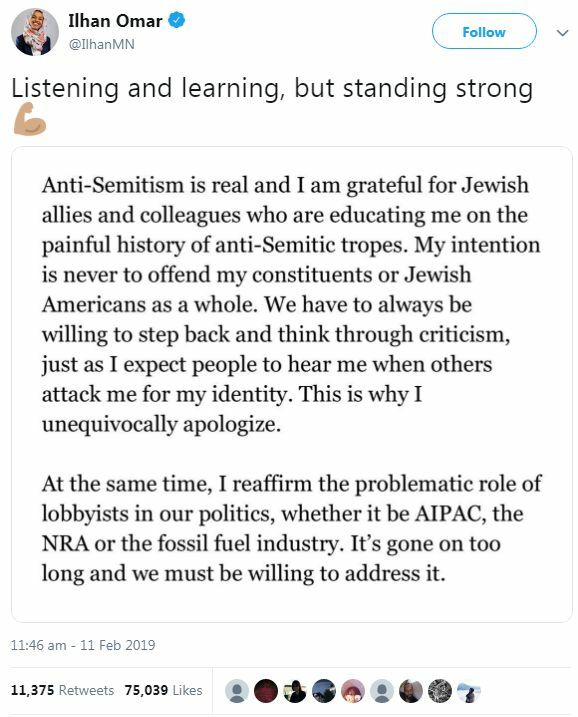 Although Omar did offer contrition, she refused to budge on “the problematic role of lobbyists in our politics,” mentioning the NRA, fossil fuel industry and AIPAC. It seems like a fair criticism, all things considered. 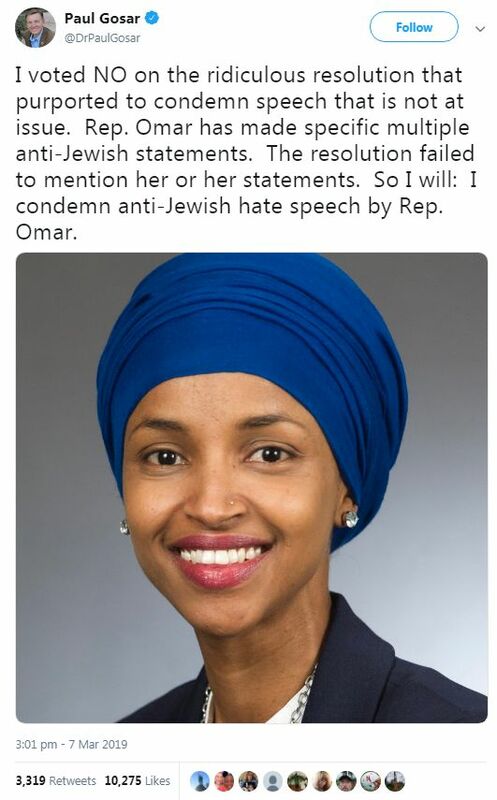 The resolution, while intended to tamp down messages of hate, conspicuously failed to mention Omar’s purportedly anti-Semitic remarks, focusing its attention instead on “white supremacists” and “white nationalists,” who were not even remotely mentioned by Omar during her bookstore comments, thus prompting 23 Republican lawmakers to reject the resolution. The partisan smashup helped to deflect attention away from the main point of contention with regards to Omar’s claim, which on the face of it does not sound radical: Does the American Israeli Political Action Committee (AIPAC), as well as the other powerful lobbying groups, hold too much sway over US foreign policy? Should AIPAC be ranked as an agent of a foreign power working on behalf of Israeli interests in the US? How much better? Well, consider that in 2016, during a breakdown in relations between the Obama White House and Israel over the question of nuclear talks with Iran, AIPAC helped persuade the Republicans to let Israeli Prime Minister Benjamin Netanyahu address a joint session of Congress – without the foreknowledge of then President Barack Obama. As a thought experiment, try and imagine the same privilege being extended to any other leader in the world. The reason it is difficult to imagine is because it’s never been done before precisely because it’s unconstitutional. “Democrats accuse Boehner of ambushing the president as the Republicans push – with the backing of the pro-Israel lobby in Washington – to strengthen sanctions against Iran,” as the Guardian reported. Another example came with the push for war against Iraq following the terrorist attacks of 9/11 against the United States. 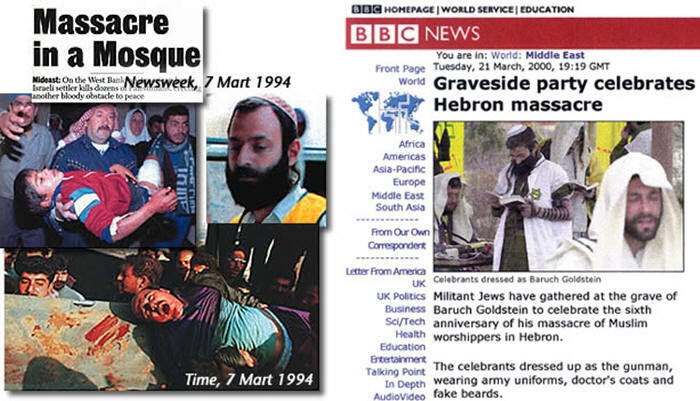 An article in the Forward admitted that as “President Bush attempted to sell the … war in Iraq, America’s most important Jewish organizations rallied as one to his defense.” As Mearsheimer and Walt pointed out, this lobbying influence on behalf of war did not flush with the opinion of the US Jewish population. “Samuel Freedman reported just after the war started that a compilation of nationwide opinion polls by the Pew Research Center shows that Jews are less supportive of the Iraq war than the population at large, 52% to 62%. Thus it would be wrong to blame the war in Iraq on “Jewish influence,” the academics argued. Whatever the case may be, the essence of the question remains the same: Does AIPAC, as well as many other lobbying groups, wield too much power in the US political system? The question cannot be casually brushed aside as ‘anti-Semitic,’ any more than questioning the power of Big Pharma, for example, could be dismissed as ‘anti-Doctor,’ or the power of the NRA as ‘anti-Cowboy.’ It makes no sense, and unfairly accuses people who are asking legitimate questions of the most loathsome charges. With the face of the American political system changing along ethnic and religious lines, it is critical that such issues with regards to political influence get a fair hearing. What happened to Congresswoman Ilhan Omar was troubling. On the one hand, because she dared to challenge the way supporters of Israel have worked to silence debate on US policy toward the Israeli-Palestinian conflict, she became a victim of incitement, and the target of legislation meant to shame her. At the same time, however, the heavy-handed tactics employed against her by some pro-Israel members of Congress backfired, exposing new fault lines in the US-Israel relationship. During Israel’s assault on Gaza, for example, she criticized the failure of the US media to pierce through Israeli propaganda and see what was actually happening to Palestinians in that impoverished strip of land. Once in Congress, she was deemed to have “sinned” again when she challenged the power of AIPAC to intimidate politicians and silence debate on Israel/Palestine. What was disturbing about this proposed resolution was that none of “Whereas” clauses included had anything to do with what Omar actually said. She never accused Jews of “dual loyalty because they support Israel”; nor did she display “prejudicial attitudes” towards Jews; nor did she ever make “mendacious, dehumanizing, demonizing, or stereotypical allegations about Jews”. What she did do was: challenge official American, and in particular, Congressional silence on the suffering of the Palestinians; the efforts by pro-Israel groups to silence debate on this issue; and the way that some have sought to create a virtual identity being pro-Israel and American interests. Because Omar has touched what some have come to say is “the third rail of American politics” she was being exploited by some Republicans and hung out to dry by some Democrats. They put a target on her back. And haters were quick to respond with frightening death threats and shameful bigoted assaults on her as a Muslim woman. There is no question that these threats against Omar were the byproduct of the sustained campaign of incitement. It’s important to note, however, that outside of the halls of Congress a different reality was unfolding. The attacks on Congresswoman Omar were rejected by many Democrats, including progressive Jewish groups, and a debate was sparked by the issues she raised and the over-reaction to them by Congress. By week’s end, the entire effort appeared to backfire. Instead of being the “slam dunk” they expected, the proposed resolution ran into blocks. Some members objected to singling out of anti-Semitism, without also denouncing racism, sexism, xenophobia, Islamophobia, etc. Others protested that Omar was being singled out and put at risk. And a few of the more prominent Democratic presidential hopefuls (Senators Bernie Sanders, Elizabeth Warren, and Kamala Harris) insisted that charges of anti-Semitism should not be used to silence debate on Israeli policy. Firstly, Representative Omar is owed an apology. False charges and a manufactured crisis have sullied her name and put her at risk. And secondly, it is clear that Omar’s courage has helped to open a door enabling a discussion of Israeli policy and the US-Israel relationship. While her opponents attempted to slam it shut, it seems that their behavior and incitement against her backfired stirring a debate that has helped to pry the door even further open. The recent British enrollment of those who fight terrorism as ‘terrorists’ is indeed funny, contradictory and reckless. Not only inside EU countries, but in UK itself, the majority reject to reward the fighters of evil, wahabbism and terrorism, by leveling false accusations. Hezbollah is the legitimate resistance for defense against the occupiers and for liberation of the occupiede territories. The history of this hero Party is clean from any terrorist attack against any civilians and innocents. It is geographically located, based and operate in Lebanon; its liberation of the Southern part of Lebanon and its steadfast victory against the occupiers’ hegemony and brutality in 2006 are remarkable. It is a Lebanese Party involved in humanitarian, social and domestic aid service, where the majority of its followers pass their days and nights in local humanitarian services. BUT, once attacked, all freedom fighters worldwide are Hezbollah! Hezbollah is a sacred noble thought and belief; stand by the oppressed against the oppressors. The tales of sacrifices and victories of Hezbollah fighters in Syria in their heroic fight against terrorism are indeed glory, heroism, and true fraternity, amity and peace. If Hezbollah Party is a ‘terrorist’ organization according the Gulf ewes, US, UK and Israel , who is not so! The Party of God has been carrying out, at times on behalf of all humanity, all and every king of generous humanitarian assistance, and not to mention its staunch Resistance and defense of all the oppressed, mainly victimized by the dirty petrodollars of the ewes. Is terrorism to occupy others’ or is it to defend and liberate the occupied! Such is the case with the Wahabbi terrorism of occupying others and hijacking the true noble and sublime values of Islam, spreading the Wahabbi terrorism worldwide! Actually, the thought, mentality and doctrine of the Party of God are mainly based on the sacred legislations and doctrines of amity, fraternity and dignity. This is perhaps one of the main reasons which makes the Party globally more than regionally as the unbreakable epic of steadfastness in the face of the sinister schemes hatched against the oppressed. The colonizers, occupiers and ewes whose main task is but to distort and conspire against every Arab and true Islamic symbol are dismayed at the remarkable accomplishments, victories, in alliance with the Syrian freedom fighters and other true friends and brothers. What a foolish move by Britain, ewes and their own masters, including the Israelis, some Westerns and Americans! Is it a prelude to launch a massive war against the Party of God? If so, the ewes are surely once more along with their masters the big losers. The innocents, from all colors, religions and thoughts, defended by and saved by Hezbollah do but refer to some of Hezbollah’s merits, when all know, deplore and condemn the barbaric state terrorism of the US, UK and the Monarchy of saws, treason and fratricide. 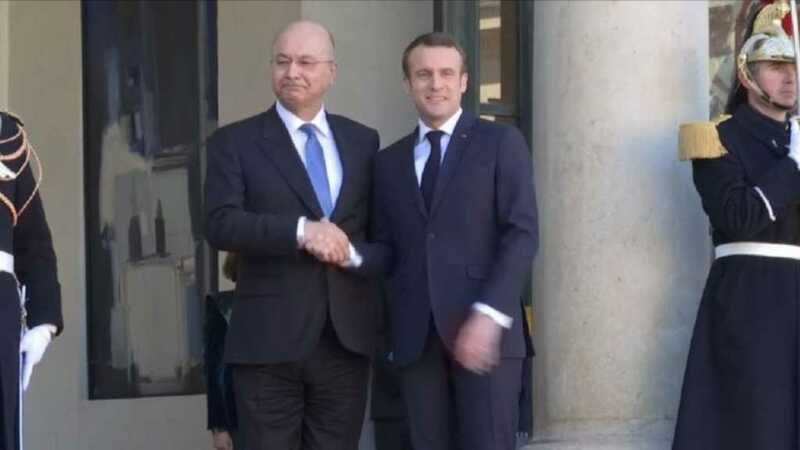 Filed under: anti-semitism, anti-Zionism, France, Hezbollah, Jewish Lobby, Jewish Power, Lebanon, Macron, Zionist entity, Zionized western countries | Tagged: Anti-Semitism Card |	Comments Off on Is Macron a puppet and, if yes, whose puppet is he?